The department's reasons for suspending the two assistant chiefs were not immediately known but evidence of ongoing corruption investigation in the San Francisco Fire Department. 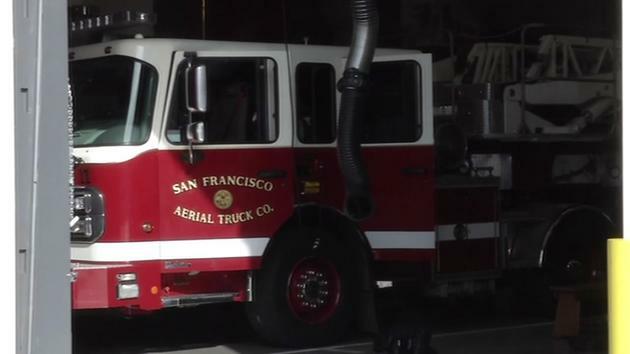 SAN FRANCISCO - Two top San Francisco Fire Department officials have been suspended for their handling of an incident last year in which an allegedly drunken firefighter struck a motorcyclist and left the scene before being tested for intoxication, sources said Wednesday. The two assistant chiefs on duty the night of the crash June 29, Art Kenney, 78, and David Franklin, 48, were notified by letter this week that they were suspended for 10 and eight days, respectively, said sources with knowledge of the matter. Department spokeswoman Mindy Talmadge had no comment on Kenney's and Franklin's status. The department's reasons for suspending the two assistant chiefs were not immediately known. Fire Chief Joanne Hayes-White has said "better decisions" could have been made the night of the crash, but has not been more specific. The sources spoke on condition of anonymity because the suspensions are a confidential personnel matter. LA Dodgers Host Firefighter Appreciation Night! Your special event ticket includes tickets to the Tuesday night game against the San Diego Padres, a VIP firefighter party at the newly renovated Unocal 76 Station in parking Lot 6 from 5 pm-7 pm which includes all you can eat food and drinks and a special edition Firefighter Appreciation Night-themed T-shirt. Proceeds from tickets sold will go to the California Fire Foundation. More information on purchasing a ticket coming soon! Tri-tip steak, corn, watermelon; all ingredients for a Memorial Day BBQ left behind at Costco by a group of Vacaville firefighters on Saturday. While shopping the crew received a medical emergency call and they left the store immediately. They returned a half an hour later to discover someone had already purchased their cart full of $123.25 worth of food. “The note said ‘thank you firefighters for all you do have a good day’ and it was signed by an Air Force wife,” said Battalion Chief Jeff Ryder, Vacaville Fire Department. Perhaps she was moved by the camouflage and American flag decorated shirts firefighters have been wearing in honor of the men and women who've sacrificed for our country. “I think they are wonderful guys they do a great job. They’re great guys,” said Rich Wood, who was shopping at Costco on Tuesday. Wood is a veteran. He said attitudes towards the military have changed greatly since he served in Vietnam. “It’s amazing how many people just say ‘Thank you’ and come up to you nowadays,” said Wood. The crew at Station 74 may never know why the woman covered the bill. “We’re hoping that that person would come by and let us thank them for it,” said Ryder. Firefighters pay for their own meals while on duty, about $25 each per shift, but they didn't pocket the money saved. Instead they plan to pay it forward. Later in the day on Saturday the crew purchased the Memorial Day flowers an elderly couple was trying to buy. Tuesday night they’re cooking dinner for a WWII veteran from Vacaville. Even before the random act of kindness the department had planned a fundraiser for Travis Air Force Base’s Fisher House, which assists the families of injured soldiers while they are in the hospital. The Vacaville Firefighter’s Association will host dinner at Pietro’s #1 on 407 Cernon Street between 4-8pm Wednesday, May 28th. Half of the proceeds from the event will go to the Fisher House. 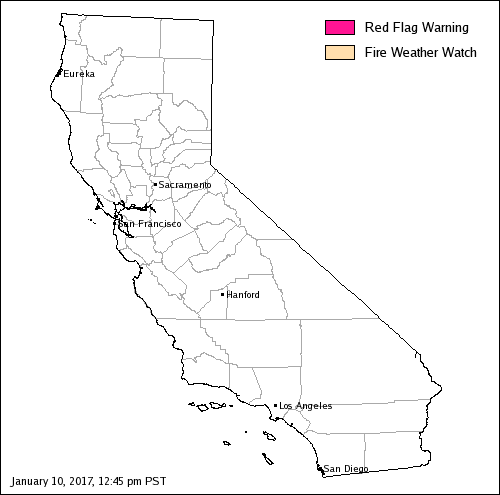 RED FLAG WARNING REMAINS IN EFFECT FROM 2 PM THIS AFTERNOON TO 8 PM PDT THIS EVENING FOR THE COMBINATION OF STRONG WINDS AND LOW RELATIVE HUMIDITIES MODOC COUNTY EXCEPT FOR THE SURPRISE VALLEY. STRONG AND GUSTY WESTERLY WINDS WILL DEVELOP THIS AFTERNOON INTO EARLY EVENING AHEAD OF A LOW. THESE WINDS WILL COMBINE WITH ABOVE NORMAL TEMPERATURES AND LOW HUMIDITIES. AFFECTED AREA: THE SOUTHEASTERN HALF OF FIRE WEATHER ZONE 285. THIS INCLUDES ALTURAS, ADIN, LIKELY, AND THE WARNER MOUNTAINS. WIND: SOUTHWEST TO WEST 15 TO 25 MPH WITH GUSTS TO 40 MPH. IMPACTS: THE COMBINATION OF DRY CONDITIONS GUSTY SOUTHWEST TO WEST WINDS AND LOW HUMIDITIES WILL CREATE THE POTENTIAL FOR RAPID FIRE GROWTH. 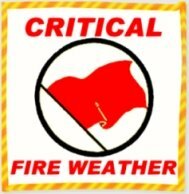 PRECAUTIONARY/PREPAREDNESS ACTIONS: A RED FLAG WARNING MEANS THAT CRITICAL FIRE WEATHER CONDITIONS ARE EITHER OCCURRING NOW...OR WILL SHORTLY. THESE CONDITIONS WILL CONTRIBUTE TO EXTREME FIRE BEHAVIOR. Evacuations: Immediate Structure Threat Hunters Valley / Hunter Valley Rd. Evacuation center is located at 2820 Hwy 140, Cathey’s Valley, McKay Hall. Update 5-30 1900: 677 acres - 95% contained; full containment expected Monday The fire burned two unoccupied homes, one smaller building and injured nine firefighters. Evacuation orders affecting more than 100 homes were lifted earlier this week.The cause of the fire remains under investigation. Update 5-28 1900 677 acres, Now 40% contained, Good progress made today on the #HuntersFire in Mariposa County. Reduction in size due to GPS mapping. Update 5-28 0730 OSCC: 1300 Acres, 20% CALFIRE IMT 6 (Estes) Activated and will transition with Unit to assume command of incident by 1200 hrs 5/28. Update 5-27 1730: 1300 Acres, 20% contained. Evacuations continue in effect., CALFIRE IMT 6 (Estes) Activated and will transition with Unit to assume command of incident by 1200 hrs 5/28. Update 1840: 400+ acres per AA. Update 1800: Per Cal Fire 250 acres. IC requesting evacuations of Hunter Valley Rd which is west of fire origin. Update 1730: 200 acres with potential for major fire, structures threatened Hunters Valley. IA: Structure fire, spreading to vegetation 20 acres. State fire crews responded to the smoke and flames about 3:30 p.m.
CA-LNU #IndianFire Lake County, east of Clearlake Oaks.Unified Command 175 acres, 75% FROSS. The Indian Fire is located in Lake County, near Indian Valley Reservoir, east of Clearlake Oaks. It is in Unified Command with CAL FIRE Sonoma-Lake-Napa Unit. The fire was discovered early afternoon, Sunday, May 25. CAL FIRE Local 2881 is saddened to report that Fresno-Kings Unit Firefighter II Roger Gonzales was found deceased in his home on Wednesdy, May 21, 2014. Brother Gonzales had just returned from fighting the San Diego complex fires. He was only 32 years old. Brother Gonzales served over 8 year of service achieving the rank of Firefighter II and completing the Fire Firefighter Academy on November 16, 2013. Our thoughts and prayers are with his family and his crew as they grieve this tragic loss. Please check with Cal Fire Fresno-King Unit by calling (559) 493-4300 for details of Brother Gonzales' services, they will be forthcoming as they are available. Roger Gonzales, a firefighter with the Fresno-Kings Unit of the California Department of Forestry and Fire Protection, died at his home Wednesday after returning from fighting the San Diego fires, department Capt. Ryan Michaels said Thursday. The Fresno County Coroner's Office will determine the cause of death. Gonzalez's family has not released much information, including funeral arrangements, Michaels said. No other information was available about how long Gonzales, 32, had worked for Cal Fire. "We are supporting the family and his crew during this difficult time," he said. Yosemite fire managers have announced that the 2014 Fire Season will begin on Monday, May 19, 2014. Fire season officially begins when seasonal firefighting equipment and personnel are in place, prepared and ready to respond. Additionally, grasses and other vegetation at the lower elevations have begun to dry out. This year, vegetation is drying out faster than average due to the low snowpack the park received over the last three winter seasons, making for fire danger above average for this time of year. The park is currently transitioning to fire season preparedness and fire resources will be available seven days per week for suppression efforts within the park. In park fire resources for the season include: fire management officials, four Type 3 wildland engines, one helicopter, and one hand crew. In preparation for the fire season, the park will begin defensible space inspections throughout Yosemite’s communities, including Aspen Valley, Hodgdon Meadows, Foresta, El Portal, Yosemite Valley, and Wawona starting on Monday, June 9. Residents and homeowners are urged to clear a defensible space of 100 feet or to property lines around homes and other structures in an effort to reduce the risk of fire hazards. With the official declaration of fire season, pile burning will be discontinued throughout the park until further notice. The fire potential is elevated statewide and has moved peak fire season conditions earlier than predicted. Yosemite National Park urges local residents and visitors to “Please be Fire Safe,” when residing and visiting the park and other public lands. Special attention should be given when departing campgrounds, backcountry camping sites, and picnic areas to make sure all campfires have been appropriately doused with water. LOS ANGELES - On May 20 & 21, 2014, The Federal Emergency Management Agency (FEMA) and the California Governor’s Office of Emergency Services(CalOES) will be testing the Urban Search & Rescue (US&R) System through a multi-team deployment exercise. The 2014 Western Region Multi-Task Force exercise, commonly referred to as the MOBEX (mobilization exercise) Drill, is a real time deployment exercise designed to test the readiness and effectiveness of the US&R response system within our State of California. Local, state and federal emergency responders are preparing Tuesday for potential disasters in a 2-day drill. The 2014 Western Region Multi-Task Force exercise, known as MOBEX Drill, is designed to test the readiness of the state's response system. The Los Angeles Fire Department, Los Angeles County Fire Department, Orange County fire Authority, Sacramento Fire Department, Federal Emergency Management Agency and California Office of Emergency Services teams were among the groups involved. In Sherman Oaks, K9 teams were practicing early Tuesday morning finding victims in the event of an earthquake. A dog searched through debris piles and barked when it found a live person. Teams also practiced using a drone to gather real-time information. "It's a chance for us to evaluate our personnel, our equipment and our capabilities," LAFD Fire Capt. Rick Godinez said. "We get new team members all the time, so we need to be ready." The official drill was scheduled to begin at 10 a.m. with an earthquake scenario set in Los Angeles. First responders and search and rescue teams are expected to be deployed.Other disaster exercises were scheduled from 11 a.m. to 2 p.m. Wednesday at Universal Studios, Castaic Lake, a Los Angeles Fire Department station in Sherman Oaks and Del Valle Training Center. 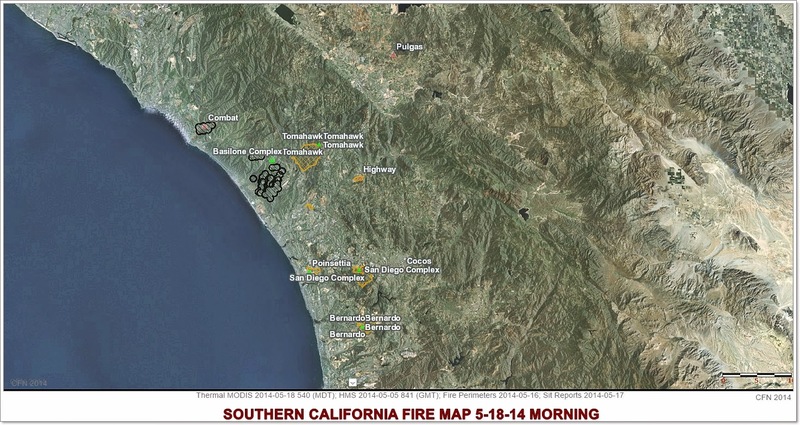 Basilone Complex Fires CA-MCP-001363;Tomahawk, Pulgas and Combat incidents. Incident managed as a complex as of 0600 05/17 by Federal Type 2 IMT Garwood. 21,240 total acres to date, 88% contained. Tomahawk Fire CA-MCP-001554; Vegetation Fire, San Diego County, Update 1430hrs: 5,367 acres, 100% contained. Fire lines are cold. Remains in patrol status. Crews continue to mop up to achieve 300 feet where safe to do so. Update 1430hrs: 1,457 Acres, 99% contained.Completed handlines around the perimeter with exception of the perimeter that is around the impact area. Fire is in patrol status. Reinforce perimeter control lines, mop up and fire suppression repair. Location: Twin Oaks Valley Road x Craven, San Marcos, San Diego County. Location: Naval Weapons Station, Fallbrook, San Diego County FRA (MCP). Location: Naval Weapons Station, Fallbrook, San Diego CountyJurisdiction FRA (MCP). 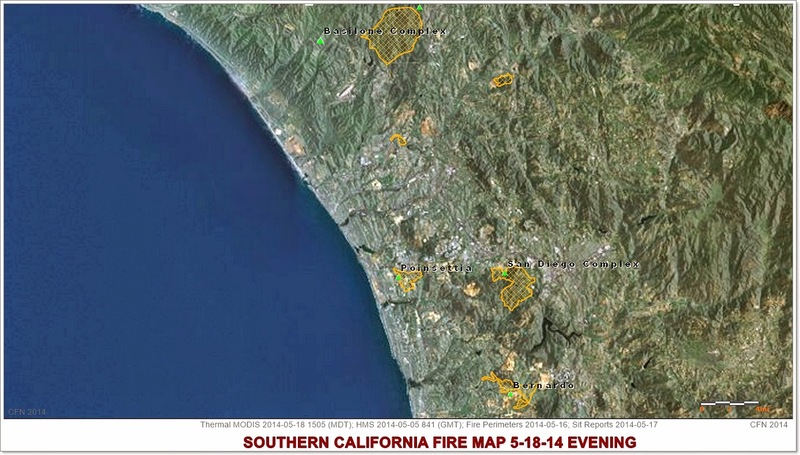 Update 5-18-14 2030: 2,906 acres, 80% contained.